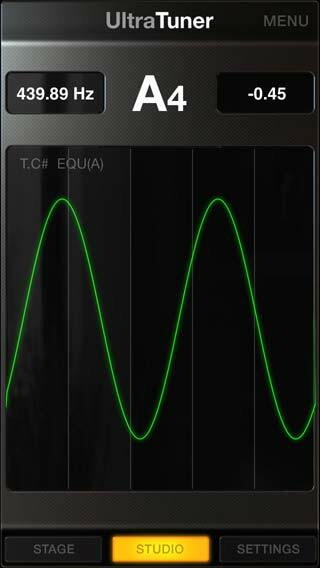 If you’re looking for the most accurate instrument and calibration tuner for iOS, then you’ve found it! UltraTuner is the most precise digital tuner available for iOS, providing precision down to .01 (yes, that’s 1/100th) of a cent. UltraTuner is 10x more precise than mechanical strobe tuners, which are generally considered the “gold standard” of precision tuners, and they typically don’t fit into your shirt pocket. 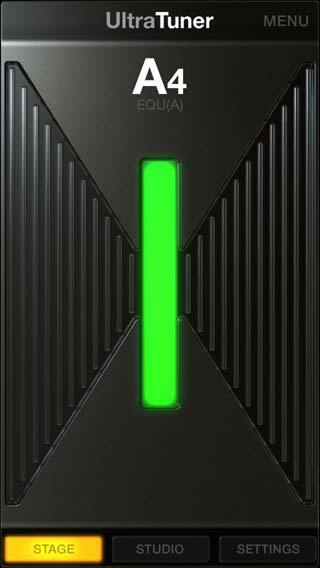 UltraTuner is a standalone app for your iPhone and iPod touch and is with you everywhere you go! 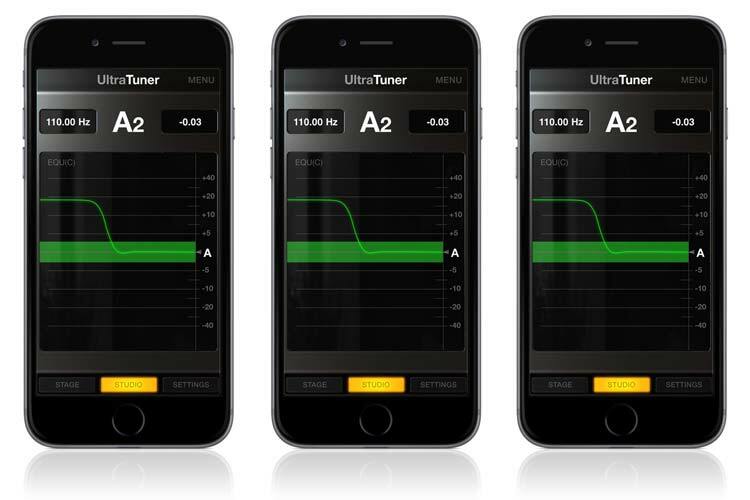 UltraTuner’s accurate pitch detection is achieved through a proprietary dual-analysis processing engine that allows the tuner to get a much more accurate reading of the frequency from the incoming note. UltraTuner gives you accuracy down to +/- 1/100th of a cent — 10 times more accurate than a mechanical strobe tuner. 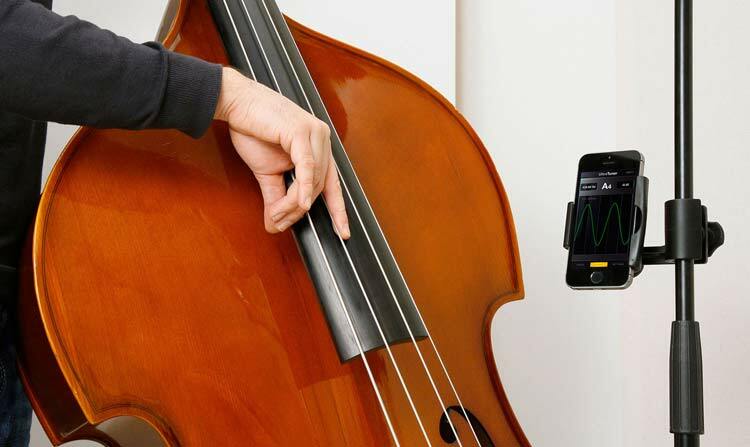 So now, when you tune your instrument, you can rest assured that your notes are right on the money. 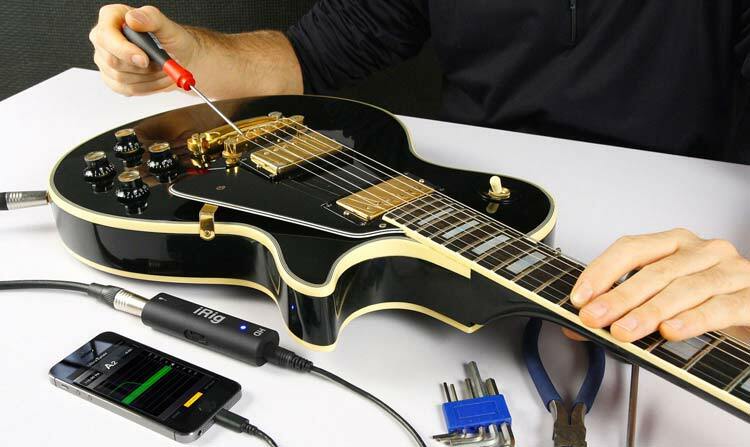 UltraTuner is the perfect guitar tech companion as well for making sure instruments are intonated correctly and play in tune up and down the neck. With its ultra-precise note detection engine, UltraTuner is also perfect for calibrating instruments like keyboards and vintage synths restoring their intonation to perfect playing pitch. UltraTuner gives you the confidence to know that you’re going to be in tune, every time. One of the joys of owning a precision tuning app is how fast it responds with note detection. UltraTuner’s note detection engine is one of the fastest and most responsive engines ever designed giving you precision pitch accuracy almost faster than your eye can pick up the display and the note transient attack has leveled. Now that’s fast! UltraTuner is designed for use on stage or in the studio and features a full screen highly intuitive tuning GUI that is easy to see and use in low light conditions, and highly visible in bright light conditions as well. Strike a note and instantly know whether it is flat, sharp or in tune. Made for the stage. Made for the studio. 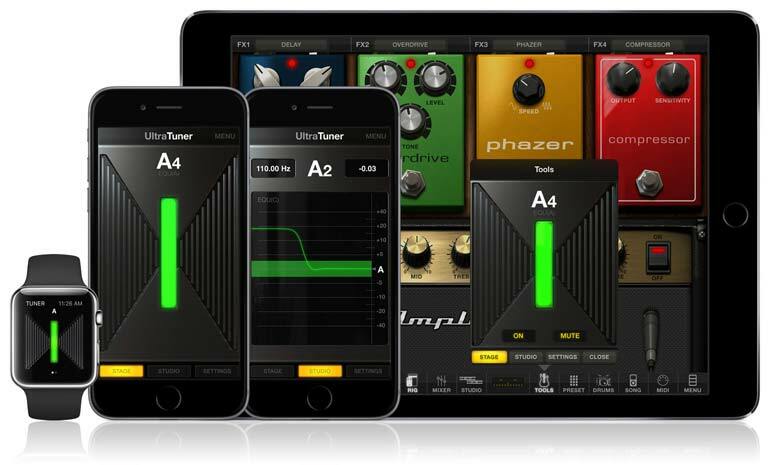 UltraTuner allows you to switch between two operational modes: Stage and Studio. This gives you the highest level of precision everywhere you play, and the cool thing is that it’s always in your pocket. When in Stage mode, UltraTuner is a straightforward, ultra-accurate instrument tuner featuring a unique, simple interface that’s very easy to see in low light conditions, and more importantly, in high-intensity lighting situations. It features a graduated flat and sharp display to indicate degrees from pitch, and when the note is in tune, the display turns green. 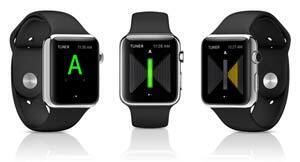 UltraTuner utilizes the entire device screen for tuning so it is easily visible from a distance on any stage. What makes UltraTuner so versatile is the ability to switch from a standard familiar tuning environment to UltraTuner’s proprietary pitch-time tracking feature in Studio Mode. 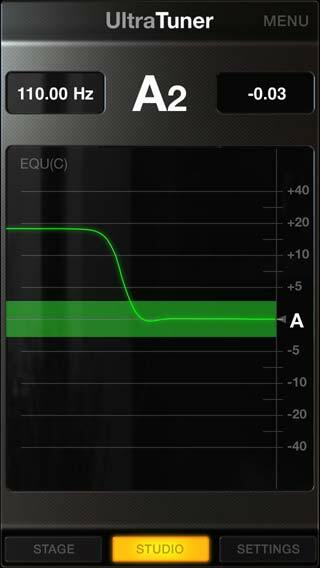 This mode allows you to monitor and track the accuracy of pitch of a note over time, in real time. This is extremely useful for vocal and ear training and playing non-chromatic instruments like violin, fretless bass, brass instruments, etc. Studio mode also offers two different visualizations of pitch: pitch over time, and a proprietary oscilloscope waveform display. The oscilloscope display indicates if a note is flat, on pitch or sharp by animating the waveform to the left if flat, completely still if on pitch, or animating to the right if sharp. This visualization is also great for vocal training and non-chromatic instrument pitch monitoring. In the settings window, you can quickly and easily calibrate the “A” note so you can play with anyone. You can also change the temperament type (a professional feature not found in most tuners), and adjust the audio input sensitivity. Temperament selection includes: Equal, Pythagorean, Just Major, 1/4 Comma Mean Tone, Kimberger III, Werckmeister III, Young and Kellner. 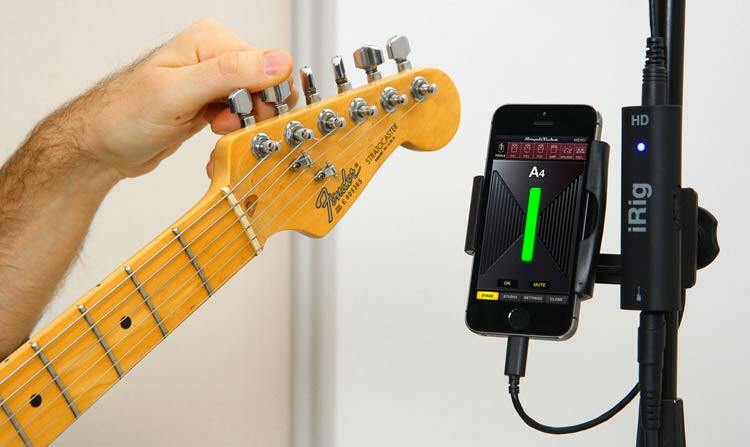 UltraTuner works with the built-in mic input for acoustic instruments, and works with all analog or digital audio interfaces for iPhone, iPad and iPod touch like IK’s iRig HD, iRig Pro and the iRig MIC series of products. And, for even more convenience, UltraTuner is also fully compatible with Apple Watch. 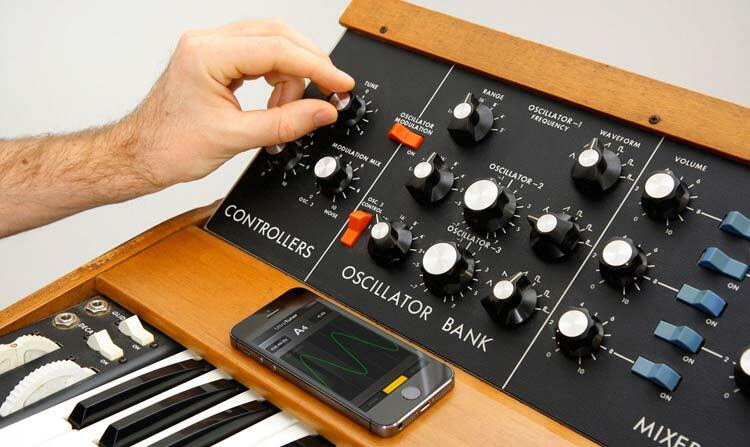 Now you can tune your favorite instruments straight from your wrist. When UltraTuner has been installed on your iPhone, it can be paired with your Apple Watch via the Watchkit extension app. This lets you see note data via UltraTuner's highly visible "STAGE" mode. UltraTuner is available now as a standalone app for iPhone and iPod touch, or as an in-app purchase within AmpliTube for iPhone and AmpliTube for iPad. UltraTuner™, AmpliTube®, are trademarks or registered trademarks property of IK Multimedia Production Srl. All other product names and images, trademarks and artists names are the property of their respective owners, which are in no way associated or affiliated with IK Multimedia. iPhone®, iPod touch®, iPad®, Mac and the Mac logo are trademarks of Apple Computer, Inc., registered in the U.S. and other countries. App Store is a service mark of Apple Inc.